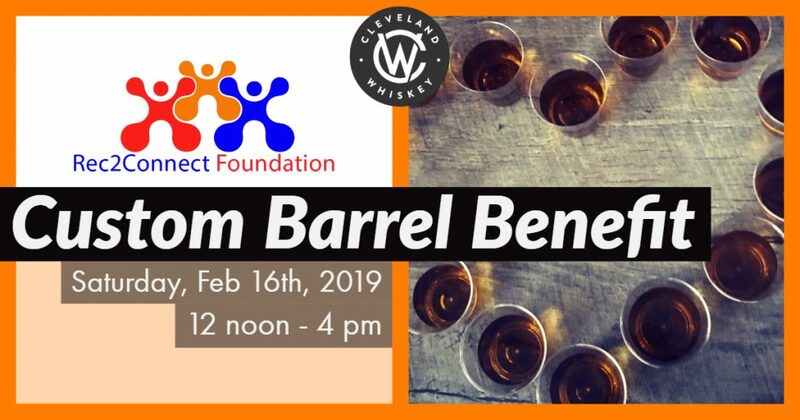 Cleveland Whiskey presents The Rec2Connect Custom Barrel Benefit. We created a unique blend bourbon especially for the Rec2Connect Foundation. This limited-run bourbon will only be available in the distillery and our goal is to sell out during the event! Cleveland Whiskey will donate $5 from each Rec2Connect blended bottle sold. We will have signature cocktails, some snacks to enjoy, and of course samples. There will be a Chinese raffle featuring a Cleveland Whiskey Barrel, a Barrelhead and a Private Tour for up to 25 people and a 50/50 raffle. We will be announcing some featured guests in the coming days, Stay tuned! Come out and support Rec2Connect at the distillery!